Granola is a great breakfast that is filling and satisfying. It usually consists of rolled oats, nuts, honey and something to sweeten it up just a little, like brown sugar. This recipe is slightly different as it does not contain any oats. It is also a great snack for when you are hungry but want a healthier alternative. 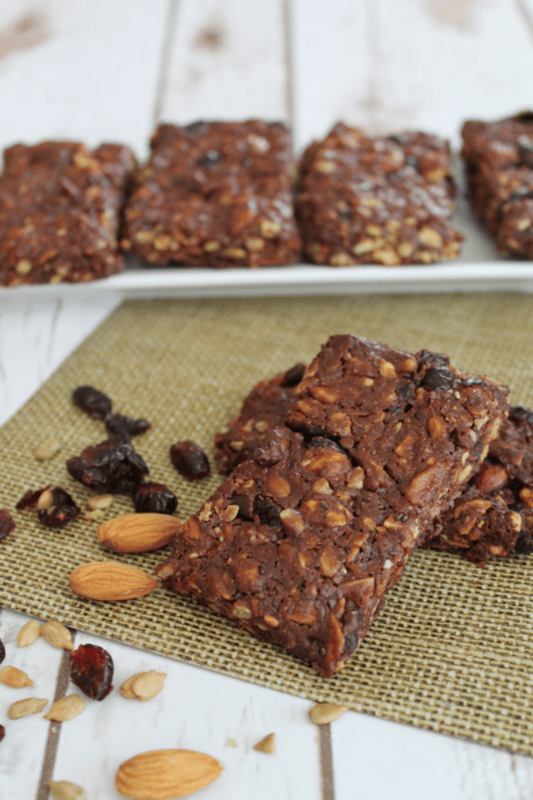 Granola bars are such a great and versatile treat that it is also used for hiking, toppings for cake, toppings for yogurt, camping and much more. I love to bake and try new things. With kids going back to school soon, I need something that is quick to make, they can grab while walking out the door and can even pack for their lunch. I decided to make my Homemade Granola Bars. When my kids were little, I would buy these buy the box at my local grocer. I soon found out just how easy they are to make and are much healthier, I stopped buying them by the box and make my own. This recipe is really fun to make and kids can help out. Using a food processor or chopper, grind or chop nuts. In a mixing bowl combine nuts, sunflower seeds, craisins, coconut and cacao chips. In a sauce pan, over medium heat, combine almond butter and honey. Once combined and melted, pour over ingredients in mixing bowl. Mix together well. Line baking sheet with parchment paper and press mixture onto baking sheet to desired bar thickness. Store in plastic baggie or air tight container. These also can be frozen and taken out as needed. I hope you enjoyed my Homemade Granola Bars as much as my family and I did. If you make it, make sure to share with us on Facebook or Twitter! Also, check out all of our other Recipes. My pleasure! Hope you like it! I don’t see them in this granola bar recipe. Do you have another recipe that uses the oats? Thanks. I love this recipe and pinning it for later.This sounds really delicious ans so much healthier than the ones we buy!! I love this idea! Thanks for the recipe. Sounds delicious! Looks like a great recipe. It seems moist enough that maybe I could fold in some oats and pumpkin seeds. I love the ingredients in this recipe! Sounds like a great combination I have to try. These are my favorite healthy and very tasty snacks.I make these awesome granola bars all the time now. This recipe is a great way to know exactly what goes into your granola bars. Thanks I will be making these are the guys when they go hunting,great healthy snack for on the go! « Do You Really Need Life Insurance?